Sunday: Bright & breezy after early clouds, shower. Highs in the 40s. Sunday Night: Mostly clear and chilly. Lows in the 20s and 30s. Monday: Increasing clouds. Highs in the 40s and 50s. 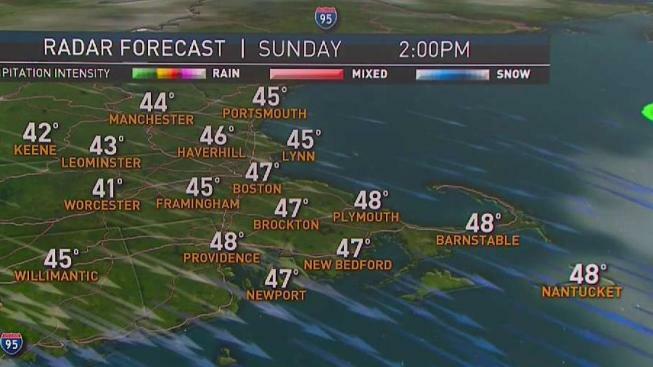 There's a big temperature drop later Sunday after we start off with some gusty showers. It’s possible that we could see some wet snow in the hill towns and even some graupel all the way to the coast. Those squalls will come with strong winds of up to 50 MPH. Although the day will start off gloomy, we will see the sunshine return by the afternoon. Wind chills will be in the 20s and 30s for much of the day. We’ll have less wind, but similar temperatures on Monday. Skies will be mostly sunny. Tuesday, a warm front will move in with some showers. Temperatures will climb into the mid 50s. This warm up will be temporary, though. A cold front will move through Tuesday night. We will finish off the week with sunshine and temperatures around 50 degrees. Next weekend should start off dry and seasonable with high temperatures back in the mid 50s.